← A Spring Day at Last! Sunshine! Yippee! Fergus Garrett, the head gardener at Great Dixter gave an interesting talk to Suffolk Plant Heritage recently, on what he called succession planting. We all try to do this to a certain extent, but at Great Dixter where the garden has to look wonderful all the time, they have to make an extra effort to make sure that there are no flat periods. This means that the garden is multi-layered, with several plants sharing a space. Today, I would like to share with you some of his advice. First of all, most of us have thought of the idea of putting small early bulbs such as snowdrops, scillas and chionodoxas in spaces that will later be filled with large leaved plants. Fergus has examined plant leaves so that he can come up with perfect combinations. For instance the lovely scented Narcissus Tazetta has large leaves which would kill many plants trying to emerge close by. Fergus suggested planting it with the large leaved Eucomis ‘Sparkling Burgundy’ which flowers later in the summer, but will quite happily grow through the Narcissus leaves. His attention to detail is meticulous. For instance he suggested growing the pretty, yellow spring-flowering Anemone ranunculoides with the emerging shoots of a Hosta. But not just any Hosta; the perfect match would be the urn- shaped Hosta ‘Krossa Regal’. Fergus has looked carefully at the leaves of the bulbs he plants. Tulips which are so great for spring colour have leaves which would kill some perennials such as phlox and rudbeckias. He plants them in groups where their foliage can’t damage existing plants. One of the ways he suggested for keeping the garden looking its best all the time, is to look out for the best form of everything. Many tulips are poor value because they don’t survive for more than a year or two. It is a good idea to look out for ones that will last, such as most Darwin hybrids and species tulips. At Great Dixter, ‘Negrita’, China Pink’, ‘Red Matador’ and the fragrant ‘Ballerina’ are permanent. It is worth experimenting to see which ones are stayers in your own garden. To take the garden into May, alliums are wonderful to fill in gaps, but again we were warned to make sure the large leaves were not too close to plants that would get smothered. The showy ‘Globemaster’ has huge leaves which could be a problem. On the other hand the dainty little Allium neapolitanum has slender leaves and pretty white flowers. It is edible too. 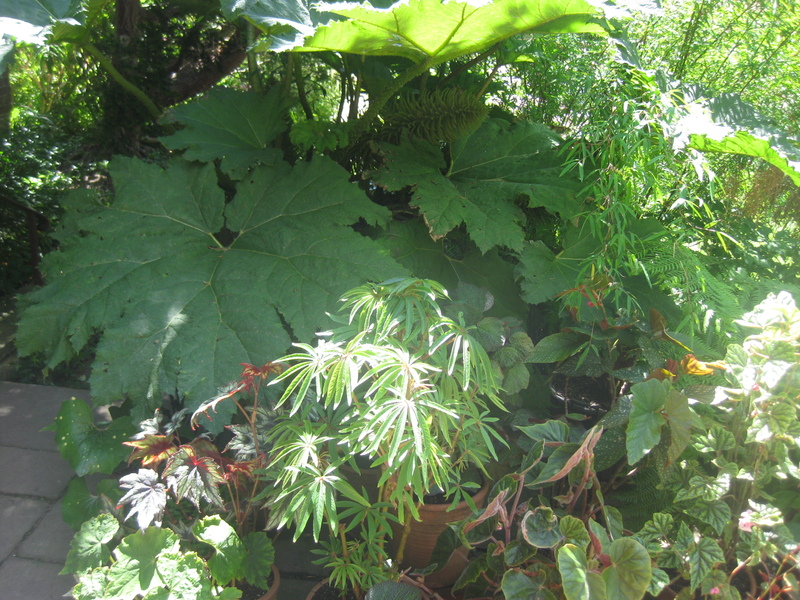 He suggested growing it with the perennial Begonia evansiana which has lovely heart shaped leaves. As most of us realise, the garden looks good all year round if it has a good structure of shrubs and foliage. Flowers come and go but foliage stays all season. Fergus has an amazing eye for good combinations of shape, colour and texture. Again, it is important to look for good forms and then, with luck you will get not only lovely flowers but long lasting foliage too. Rodgersias have beautiful leaves, but unless you live somewhere with a heavy rainfall, they look awful later in the season. If you can find Rodgersia pinnana ‘Maurice Mason’, it will look good all season. It starts with chocolate brown leaves and later it gets long lasting red flowers. Thalictrums have such dainty flowers, but their lacy foliage is delightful too. Particularly good is Thalictrum ‘Elin’ which is the tallest Thalictrum. It has beautiful, purple foliage. We were shown a photo of Thalictrum ‘Illuminator’ with the lovely purple foliage of Clematis recta ‘Purpurea’ and the fresh foliage of an Oriental poppy -no flowers, just a lovely combination of leaves. I visited Great Dixter last summer. Looking at my photos now, I realise that the garden is not just a profusion of plants growing randomly. It is all carefully orchestrated. In the next photo see how the shape of the teasel echoes the drumstick Allium sphaerocephalon and the little blue Eryngium heads. 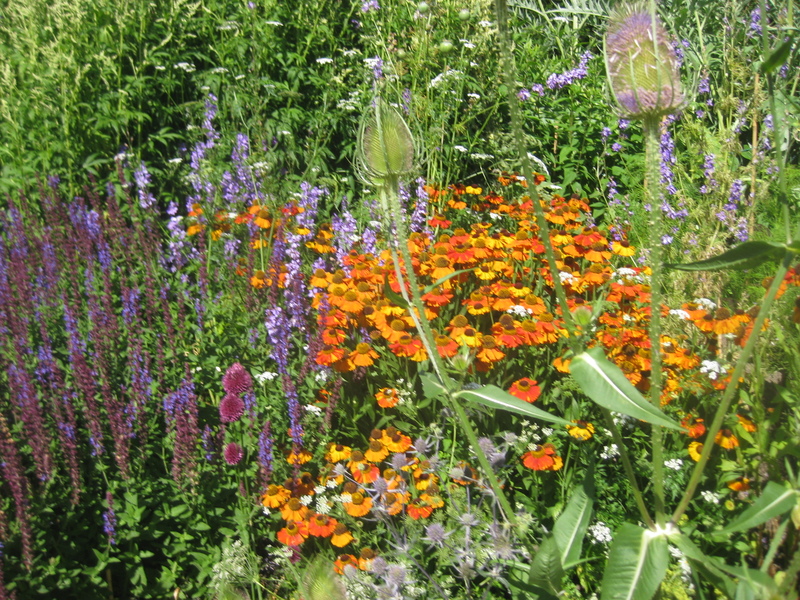 And how good they look with the orange helenium and the blue salvia. The following photo shows Thalictrum ‘Elin’ with a lovely pink Hydrangea and the purple leaves of a rodgersia in the bottom left hand corner. To the right is the honey scented Euphorbia mellifera. The exotic garden really shows off a wonderful array of foliage,with varying shape and texture creating a wonderful picture. Because most of the plants are tender, it changes every year. Of course the pots at Great Dixter are famous, specially round the front door. Pots are a great way of ringing the changes round the year. Pots are also used at the front of a border in the next shot to accent the foliage and give a tropical look. Here are some other lovely combinations Fergus suggested. Sambucus ‘Black Lace’ with the white flowered Persicaria polymorpha. This photo shows the lovely black leaves of the Sambucus, which is of course an Elder. You can just see the white fluffy heads of the Persicaria on the left. The grass in the foreground is a Pleioblastus. 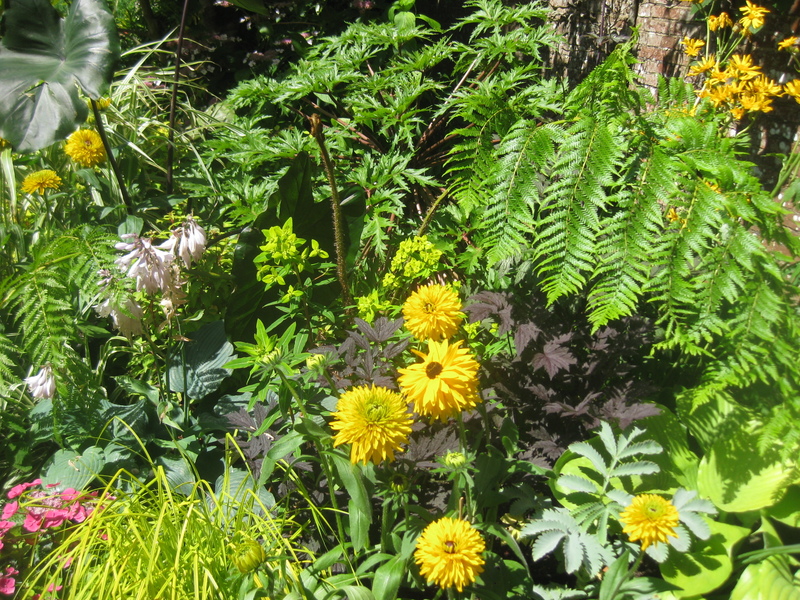 Two more suggestions are spiky, silver Astelia leaves with golden Acanthus mollis ‘Hollard’s Gold’ and the all year- round, tall, upright grass, Calamagrostis x acutiflora ‘Karl Foerster’ with my favourite fern; Polystichum setiferum ‘Pulcherrimum ‘Bevis’. There are lots of grasses at Great Dixter which provide structure for all the profusion of summer flowers and look good all year round. 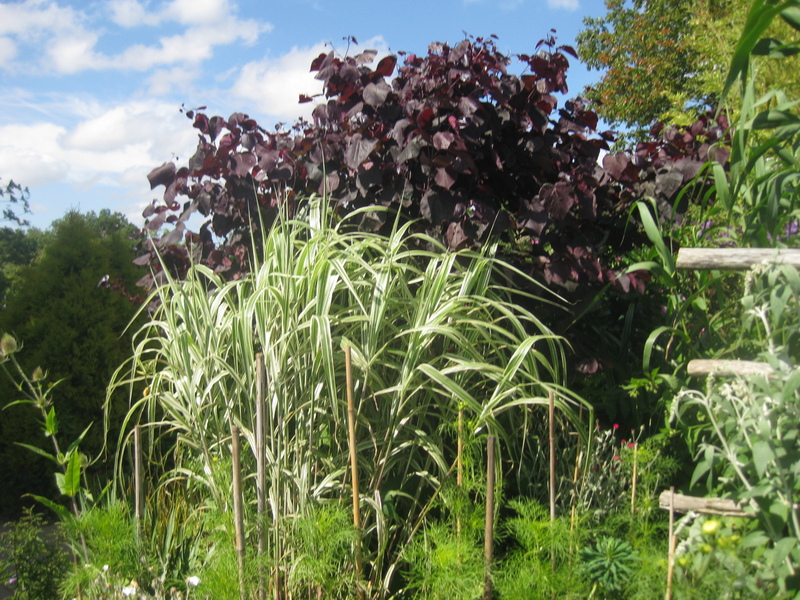 If you want more ideas on grasses, have a look at the blog, Barn House Garden. 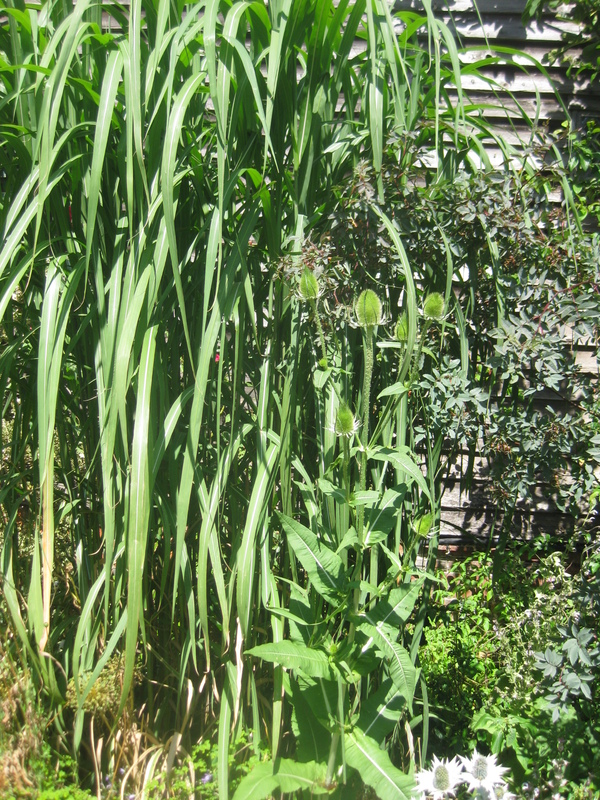 Kate has a wonderful blog and great ideas for grasses and how to grow them. I am not sure what the next grass is, but it looks like a Stipa. I loved the idea of a dwarf form of the lovely, silvery cardoon, Cynara cardunculus ‘Chelsea Physic Garden’ with the magenta flowers of Geranium riversleaianum ‘Russell Prichard’. This Geranium blooms for weeks on end. Another long lasting geranium is ‘Anne Thompson’. I have bought this one, because Fergus says it is similar to the magenta Geranium psilostemon, but for it blooms for 4 months instead of 1 month. The other mainstay of Great Dixter is the use of annuals. Of course, they can afford to produce their annuals on a grand scale and each year they experiment with different combinations, and what fun it must be. We can’t hope to produce them on such a scale, but Fergus suggested we grow annuals and have pockets of them here and there to take the garden into autumn. 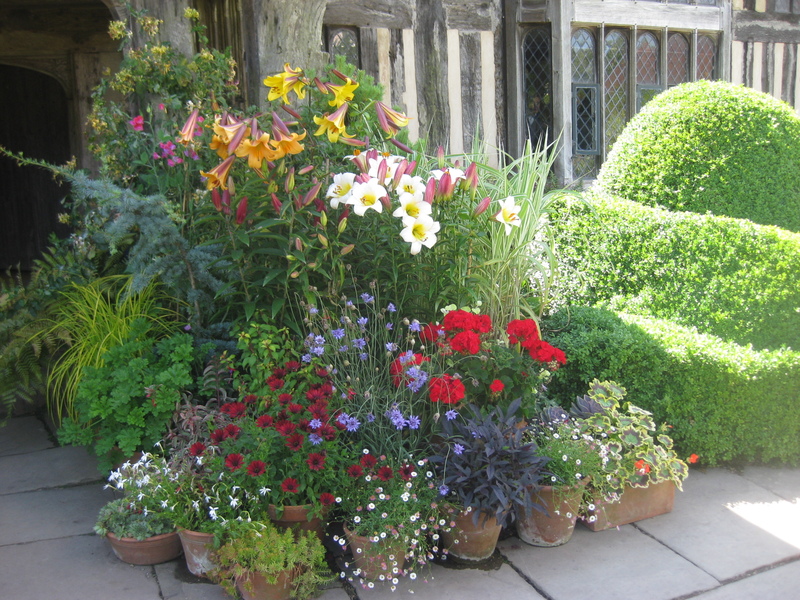 Great Dixter relies heavily on self sown annuals to give labour -saving colour. In spring there are forgetmenots with yellow Smyrnium perfoliatum looking great with tulips. 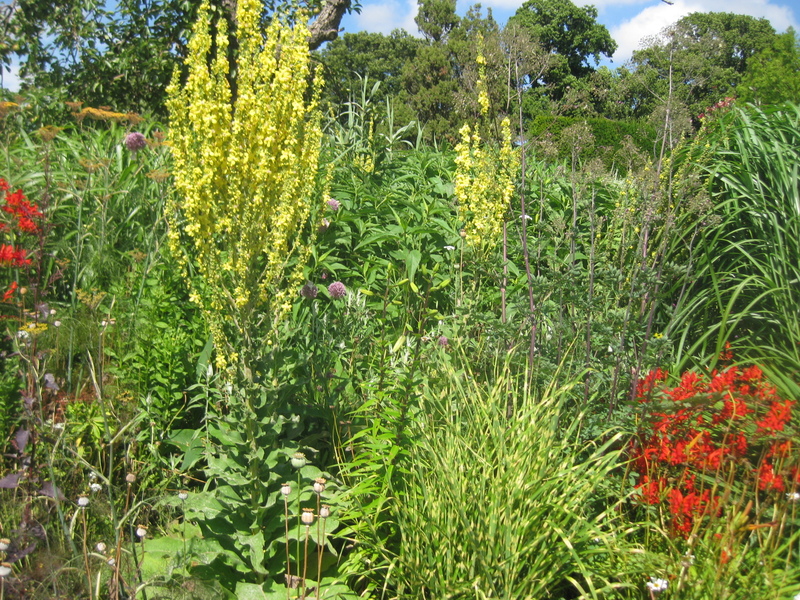 Later, there are lots of Christopher Lloyd’s trade -mark stately Verbascum ‘Yellow Lightning’. Some of the self-sown plants which they allow are really weeds. For instance last year, they had cow parsley growing in the beds. This is a deliberate attempt to make the garden more natural looking. They have teasels, evening primrose and I even saw some ragwort last summer. Fergus said to prevent prolific seeders like Red orach, Atriplex hortensis taking over you can hoe off the first germination. More will germinate but not quite so abundantly. 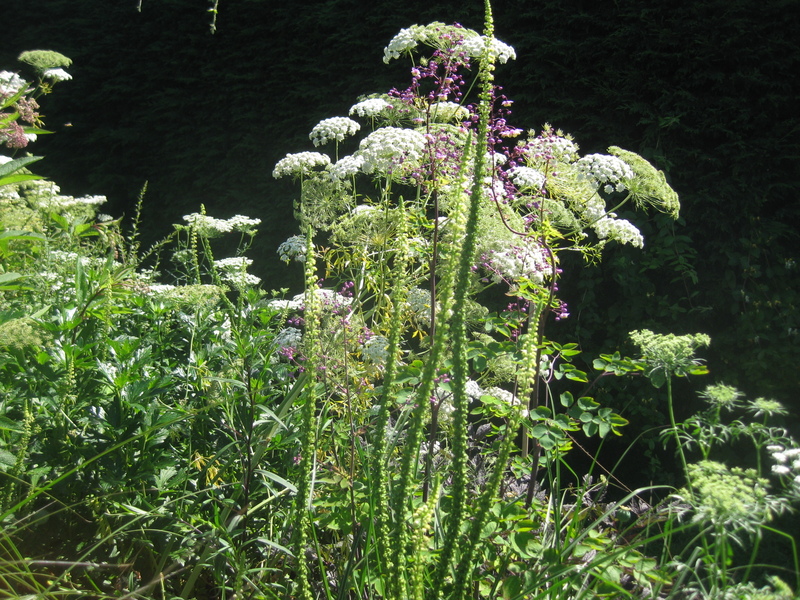 I love the wild Reseda; Mignonette against the frothy heads of Orlaya and the delicate Thalictrum. 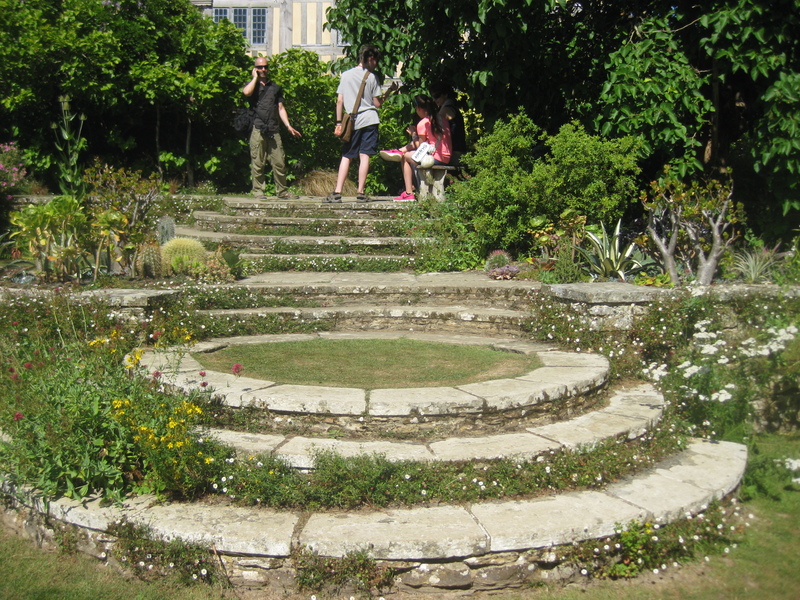 The little daisies of Erigeron karvinskianus seed all round the Lutyens steps and how pretty they look. 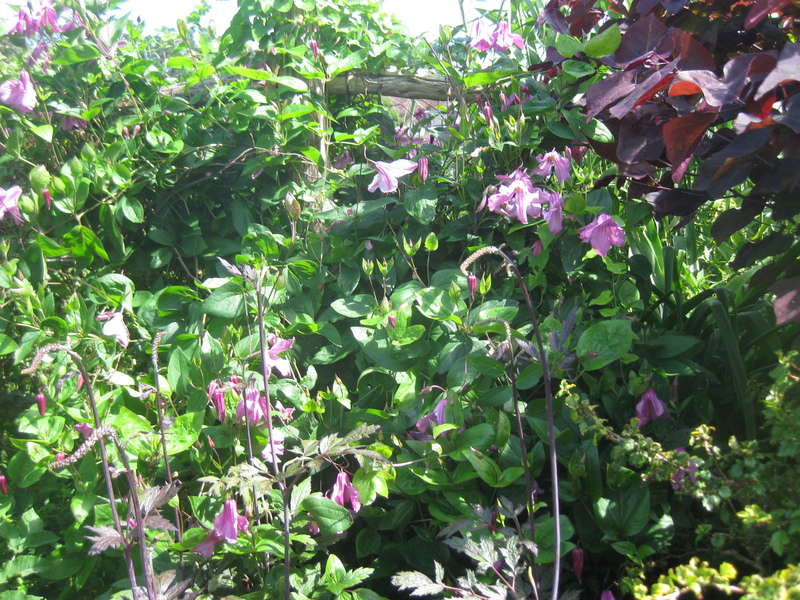 Lastly, Fergus showed us clematis clambering through the shrubs to extend the season of interest. The small flowered Clematis viticella and Clematis texensis with pretty urn-shaped flowers are best for this. He also recommended Clematis fargesioides ‘Paul Farges’ for a vigorous plant, with long lasting, starry white flowers, with primrose stamens. This is also known as ‘Summer Snow’ and is well worth seeking out. Stronger growing Clematis montana or honeysuckles are grown at Dixter but pruned to stop them killing their host shrubs. I have got a bit behind with blogging recently, as I am spending all my time on two new projects in the garden. They are absorbing all my time and energy. I shall show you what I have been doing when they are finished. Meanwhile I believe rain is forecast, so I shall have a chance to catch up with everybody. Have a lovely Easter! 74 Responses to Succession Planting. What wonderful information you have provided. Fergus is incredibly generous with his advice, offering specifics rather than just general concepts. And he’s so easy to like and admire. I was lucky to sit with him at lunch a few weeks ago when he was speaking at a gardening symposium in North Carolina and it was quite a thrill, as any gardener can imagine. I think 2017 is going to be the year I finally treat myself to one of the week-long symposia at Great Dixter. Fergus is incredibly knowledgeable and so unassuming. How wonderful to spend a week at Great Dixter, I hope you manage it. Brilliant advice, I feel I was present at Fergus’ lecture. Thank you. I’m intrigued to know what you’ve been doing. Thank you Christina. One of my projects is a secret garden, so I am busy digging up part of the orchard and moving all the daffodils. The whole thing will take a while as it is a big project. Oh that will be lovely. Thank you for all these lovely suggestions, very helpful indeed! I’ m glad you enjoyed it, thanks for commenting. Fergus is always full of good ideas. I believe he comes to the States sometimes, I don’ t know where he gets his energy from. He delivers his talks at an express train speed. Wow, If I had Angus’s job, I think my head would explode! I get too emotionally attached to plants as well. How wonderful they are growing weeds in the beds at Great Dixter, did Christopher Lloyd start that? I don’ t think Christopher Lloyd grew wild flowers on the scale that Fergus does. He is determined not to keep the garden in aspic, but to use his own planting ideas and to keep moving the garden on. Liz, I love that and I think Angus is right in doing so. That said, do people still eat aspic in England. Tomato aspic is fodder for jokes here? I’ m not really sure whether people eat aspic, it’ s made out of gelatin isn’ t it? I certainly don’ t eat it. I have never heard of tomato aspic, it sounds revolting. Do you eat that stuff? No, it is revolting – tomato juice, spices and gelatin, with vegetables arranged inside. Gelatin salads were very popular here in the 70s and are coming back into style with Millenials. Boomers tend to avoid them. Best wishes with your projects and happy Easter! Thank you Kris. I love self seeders too, they always enhance the garden and often produce some great combinations that you might not have thought of. Some fabulous combos there.. 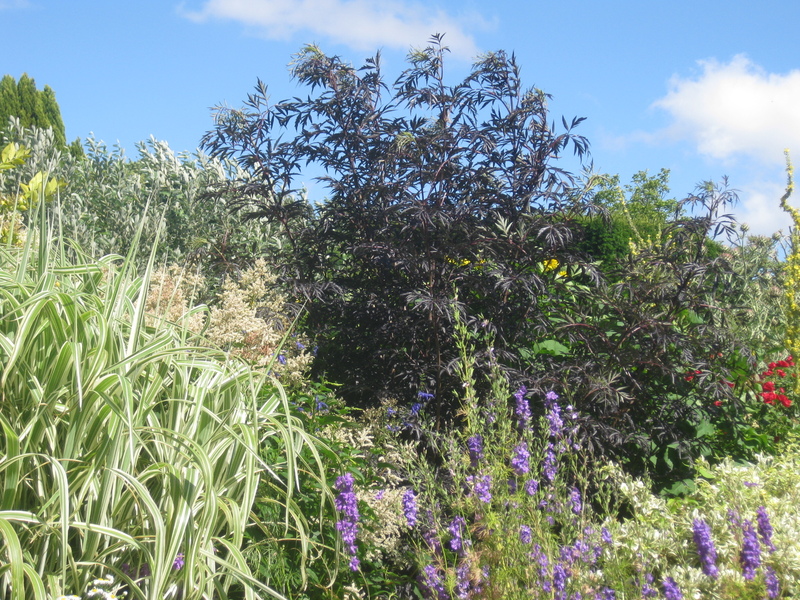 I love the black Sambucus and white Persicaria. It’s been a great few days for getting stuff done in the garden. My bones are aching so much now I am almost grateful for a rain induced break. Happy Easter Chloris. We have had some wonderful weather and I have been gardening all hours too. It’ s all turned to worms now though with Katie hurtling through creating chaos. I am going to look out for that persicaria, apparently it is not invasive like so many of the others. Oh it must have been sheer pleasure to listen to such a talk Chloris. Thanks for such an in depth summary. You’ve whetted my appetite further for a visit to Great Dixter planned for later this year. I hope that you’ve had a productive day in the garden today and have a bountiful stock of chocolate to see you through the rain and wind forecast for the weekend. Happy Easter! I hope you get to Great Dixter this year Anna, it is well worth a visit. Fergus is very generous with his advice. I have heard two of his talks now and both were really interesting. A very interesting post. I would have liked to hear his talk. I think we each have to experiment in our own gardens as no two gardens are the same (especially if you are on an other continent!) Even in the same garden, I find plants can behave differently from year to year. That is why succession planting is so difficult but it does produce amazing results when it is well done. Thank you for this very good post. I am glad you enjoyed it Alain. You are quite right, nothing beats trial and error and observation in our own garden. Very impressive. I’ve been trying to do this more and more as time goes by (and as my budget allows). Thanks for the tips for plant combinations and for the examples. It amazes me how these types of gardens can look so warm and welcoming (not too formal), and yet it’s clear there was a specific plan for it all. Lovely! Great Dixter is a very special garden created by Christopher Lloyd. So many gardens lose their soul when the owner/ creator dies, but Great Dixter goes from strength to strength under the care of Fergus. You’ve provided a great description of succession planting: one of the best I’ve ever read, complete with examples and photos. Really well written and interesting. Thank you very much Mrs. Daffodil, what a lovely thing to say. I am glad you found it useful Frances. It must be a problem for you sourcing good plants up there, I suppose you have to rely on mail order. I quite like a few wild flowers in my beds, the trouble is that so many of them can become invasive. Thank you for sharing Fergus’s tips, what an interesting talk it must have been. Great photos of your visit last summer too, the reseda,orlaya, thalictrum combination is fantastic. What a lovely surprise to see that you’d mentioned the garden. Bless you! Thanks Kate. Well of course I have to mention you when I am talking about grasses. You are the queen of grasses and your posts are so informative. It is always inspiring to see how other gardeners combine plants Chloris, and I do hope to visit Dixter one day myself. Look forward to hearing about your projects. In the meantime enjoy the rain and have a welcome break and a happy Easter! Thank you Cathy, I hope you have had a lovely Easter too and have avoided the ravages of storm Katie. P.S. I think the gorgeous grass in question is Calamagrostis emodensis, a great alternative to Stipa gigantea. Trust Great Dixter to use something rather special 😉 . Oh thank you for the ID Kate. I thought the seed heads looked too fluffy to be Stipa gigantea. I haven’ t heard of this Calamagrostis but I will look out for it. I’m a Fergus-fan too! 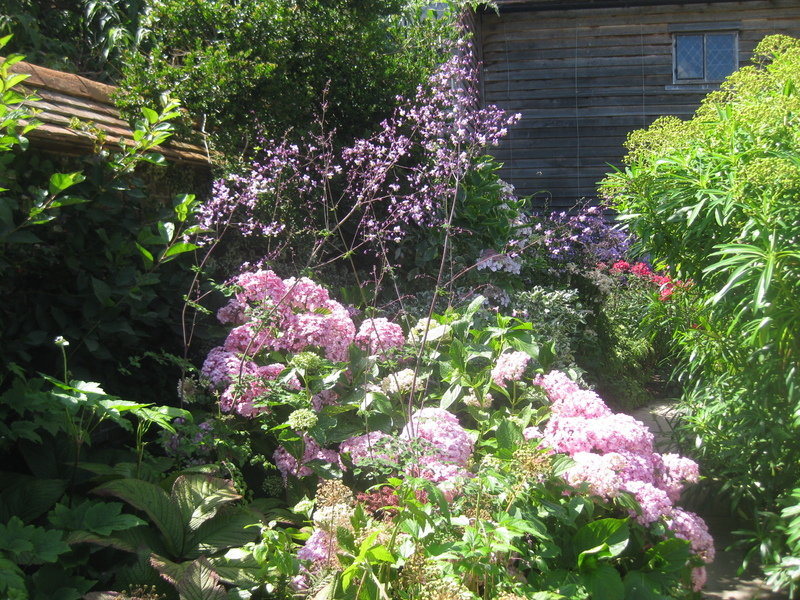 Sorry, Great Dixter-fan… I attended a one-day course there about 8 years ago on succession planting – it was all a total inspiration and much of it has stayed with me. It’s interesting to read about your talk and see how his advice has developed. His enthusiasm and passion is totally infectious and there is plenty to apply in our own gardens. Lucky you doing a whole day course, it must have been fascinating. Fergus really does inspire with his enthusiasm . It was brilliant Liz. I highly recommend it if you get the chance. It was a christmas present from my husband and probably the best present he’s ever given me! Thanks Flighty, I hope you have had a great Easter. I am glad you enjoyed it Ali. I have to take Fergus’ s word for the fact that Ballerina is scented. I grow it but have never noticed. This year I will sniff it and let you know. I think we are so fortunate in this country to have such a wonderful source of inspiration as Great Dixter and Fergus Garrett. I wish I lived closer so that I could visit more often. Christopher Lloyd wrote a book on successional planting which is a useful source of info and inspiration. I haven’ t seen this Christopher Lloyd book although I do have several of his and I enjoy them all. 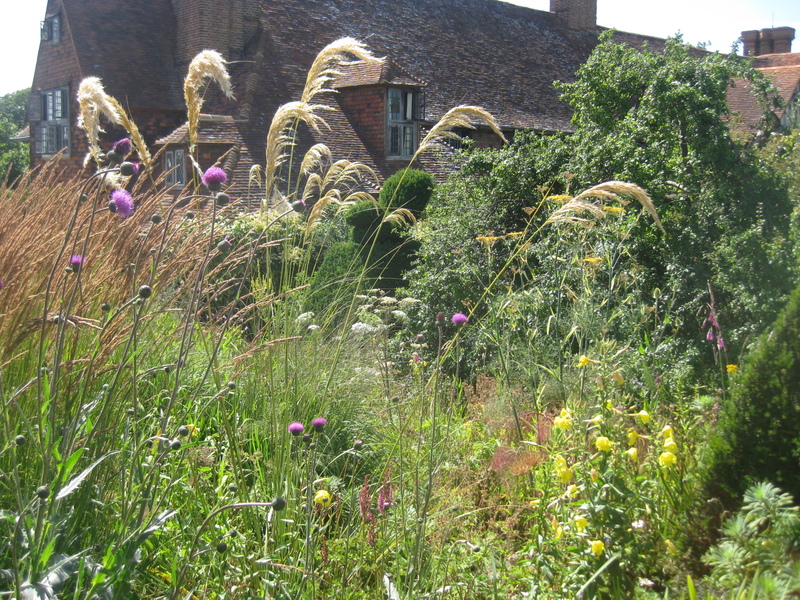 I would love to visit Great Dixter at different seasons. He wrote three books for the BBC, colour,exotic and succession planting for adventurous gardeners. I’m a Fergus fan too and attended one of his talks at a local NGS garden which was on succession planting. He is so generous with his time as and his talk was an inspiration. I should re-visit Great Dixter. My one visit was on the hottest ever weekend in 2004 and visitors were literally dropping like flies. The tall grass caught my eye too and I’m grateful to Kate for the ID. I planted thalictrum last year – it’s a variety with a beautiful purple stem bought from an NGS garden. No sign of it so far. Lovely to see a post from you Chloris – you are always so generous with your knowledge and ideas. I’m gardening two gardens and my allotment and after a full day at the cottage yesterday I was very grateful for the rain today. Thank you Sarah, what a lovely thing to say. If you haven’ t been to Great Dixter since 2004 then it is time you went again you will notice some changes. I don’ t know how you manage two gardens and an allotment, you must have boundless energy. Excellent summary of the talk by Fergus Garrett. I agree with him about the tulips – that’s one of the reasons why I mostly grow the larger hybrid tulips in containers, so that the foliage doesn’t smother any nearby perennials. Thank you Jason. Your pots of tulips make such a wonderful show, it is a great way to grow them. They don’ t make such an impact in the garden. You would love Great Dixter Gill, I hope you manage to get there one day. Informative as always.Have fun with your projects. Happy Easter. Thanks Susie. Sorry about the late reply, these projects really hsve been taking up a lot of my time. Oh Wow, what a fantastic speaker for your plant heritage group, you must of been thrilled and thank you for sharing so many great tips, plant combinations are the route of most frustrations or pleasures! – I’ve saved your post into my reading list to revisit again. I’ve started to grow clematis through shrubs at home, interesting to read they grow Honeysuckles in that way too. Fergus did warn that Honeysuckles or Clematis montana have to be very firmly controlled if they grow up a shrub or they will kill the host. You’ve shared many wonderful companion planting ideas! I’ll refer to this post again and again to help fill seasonal gaps in my own beds. Thank you so much! I am so glad you found it helpful Peter. I did take copious notes as I had promised to write about the talk for th PH Journal. I do anyway, I like to refer back. The secret garden is rather an ambitious project, goodness knows how long it will take. Enjoy the process, however long it takes! Daffs are usually more persistant. Are you sure you leave the leaves to die off before you remove them? The projects are about to be revealed. What a great talk from a great gardener. I have a few of Christopher Lloyd’s books and they are always a great winter re-read and I would love to visit Great Dixter someday. How fortunate he has left it to be enjoyed by many future generations. I’m looking forward to hear of your projects. You always have something good up your sleeves! I love Christooher Lloyds’ books. He was always interesting and informative. I do love a project in the garden. I shall be sad when I eventually run out of space for new ideas. I suppose I shall have to dig it all up and start again. Very interesting, Chloris. I’ve read quite a bit about Great Dixter and I believe I read a profile of Fergus in Country Living. Such good advice here. Great Dixter is a wonderful garden Cynthia. If you ever come to England do put it at the top of your garden visiting list, along with Sissinghurst. I hope to visit one day, Chloris. Thank you. Oh good, Allison, I am so glad you found it useful. Almost as good as hearing Fergus himself. Attention to detail beyond what most of us even think of. Thank you Linda. It was such an inspiring talk. I would love to see Dixter! I’ll be in England this summer but I’m not sure if I’ll have time. Such great tips! Where will you be in England? If you come to Suffolk do come and see me.